Rosolli is the classic salad accompaniment to the Finnish Christmas meal, going particularly well with the cured herrings. Some add herring to the rosolli, when it is then known as sillisalaatti – herring salad. This variant is particularly common in Sweden. We, though, prefer to serve the salad without adding herring, and serve several different side dishes of herring that one can pick from. Rosolli is a perfect reflection of seasonal eating, made only from those ingredients that one would typically have available from the root store and pantry. The main ingredients are beetroots, potatoes, and carrots. The flavour is enlivened with apples, shallots or onion, and gherkins. The dish is traditionally served with rosollikastike – an accompanying sauce that is mostly whipped cream, coloured with a little beetroot juice, and seasoned with a splash of vinegar and a pinch of salt, sugar, and white pepper. Personally, although I like the rosolli, I have no idea what this sauce is needed for – it does not taste of anything much and does not seem to add anything to the dish. However, both CT and mother-in-law Riitta insist that it is somehow essential, and never let me forget to make it. As with any recipe of this nature, quantities are somewhat arbitrary and can be varied depending on what is available and according to taste. I prefer, for example, to add less carrot than potato and beetroot, but other recipes might call for more or less equal quantities. The rosolli is often decorated with chopped boiled egg. For example, the whites and yolks can be separated and chopped finely, then sprinkled in stripes over the top of the salad. Although we have done this from time to time in the past, we do not generally bother any more. It just seems unnecessary, and the rosolli is great just as it is. If using ready cooked beetroots, remove from the packaging, reserving a few tablespoons of the juice for the sauce, if making. If using fresh beetroot, place in a pan, cover with water, and simmer until tender. Remove the beetroots and reserve a little of the cooking liquid. Allow the beetroot to cool, then top and tail and skin. Cook the potatoes in their skins, in a little water, until just cooked. They must not be too soft as they will break up when chopped. Drain and allow to cool. Cook the carrots in their skins, in a little water, until just tender. They must not be too soft as they will break up when chopped. Drain and allow to cool. Finely chop the gherkins and place in a large bowl. Peel the apples, if desired, then core and finely chop. Add to the gherkins, stirring well, so that the acid from the gherkins will prevent the apples from discolouring. 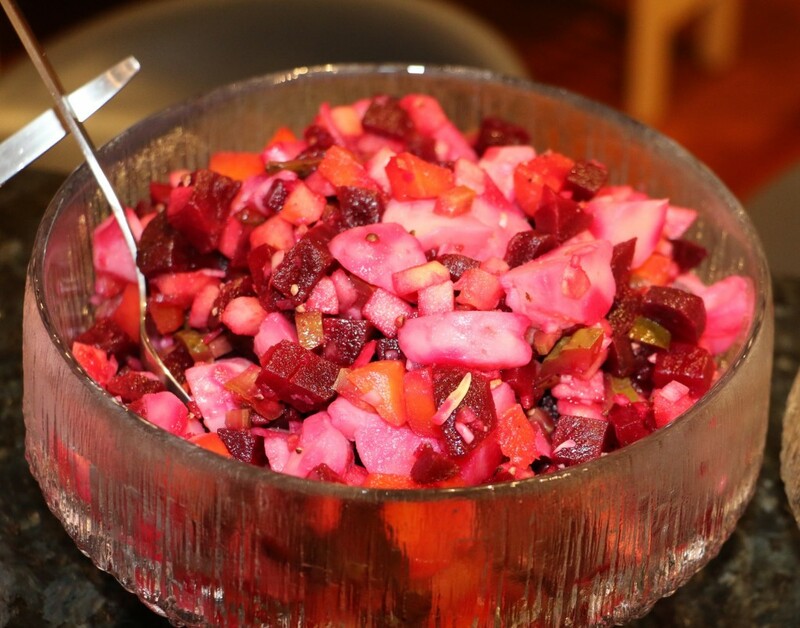 Chop the cooked beetroot, potato, and carrot, and add to the bowl. Finely chop the onion and add to the other vegetables. Drizzle over the vinegar, adjusting to taste, so that there is a little bite to the salad. Season to taste with salt and white pepper. Mix well, then cover and place in the refrigerator for several hours for the flavours to develop. Whip the cream until it holds its shape, but do not over beat it until completely solid. Mix in the vinegar, salt, white sugar, and white pepper. Add enough beetroot juice to turn the cream a pale pink colour. Best prepared just before serving, but can be refrigerated until needed. This entry was posted in Recipes and tagged apples, beetroot, carrots, onions, potatoes on December 27, 2014 by JV.